First published in the February 2012 edition of the Hearing Times. 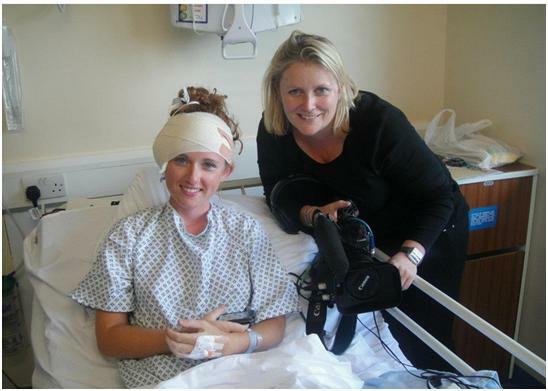 Claire (pictured right, with Meghan after her cochlear implant operation) has worked in TV for eight years, starting off in wildlife documentaries before moving into filming people instead. After working on programmes about children in care, she worked on medical series like 24 hours in A&E and went on to film in Africa. Deaf Teens: Hearing World is the first one hour programme she has directed. Where did the idea for Deaf Teens: Hearing World come from? My Dad is becoming deaf and he said that it makes people instantly assume you are a bit daft, so I wondered if this was even worse for young deaf people. Once I had spent the day at a deaf school, I decided that they had plenty to say and there was so much to learn about their experiences of being deaf and the deaf community. I wanted to know what it was like to be a deaf teenager – were the rules of engagement different – do deaf people only date other deaf people? What’s it like to go to uni when you can’t hear any potential friends? How is it going from a fully deaf school in to the hearing world? How did you get the film commissioned? This film is part of the Fresh strand on BBC3, which is an opportunity for relatively new directors to make their first one hour programme. It is a great opportunity to work on a programme that you have come up with – I pitched the idea to the BBC executives, then literally worked on it from start to finish. Your film features various ‘types’ of deaf people – signers, cochlear implant users and so on. Were you surprised that such variety exists within the deaf world? I was amazed that within one community there could be such a variety of people, so many different viewpoints and yet such a close-knit group of people. Two deaf people might have very different viewpoints on, for example, cochlear implants – one might have a cochlear implant and the other might be staunchly against cochlear implants believing them to weaken the strength of the deaf community – but it won’t stop them being friends. How did you deal with communication during filming? In a variety of ways. Christianah and Meghan used speech so I just conversed with them directly. They are masters of lip-reading and as long as I remembered to take the camera away from my face before I spoke, faced them and didn’t mumble we got along fine! Jake and I could converse to a certain extent with the help of his family and on one occasion we used an interpreter. With Sara and Asher, who are BSL users, I had an interpreter for just about all the filming with them. Were your perceptions of deaf people changed by making the film? I was amazed at how important deaf identity is – most of the young people seem to find such solace in being with other deaf people and it seems like an amazing ‘club’ to be involved in. Their culture is very attractive, it is a friendly, warm, tactile culture with a beautiful language at the heart of it and many brilliant people who just see the world in a very slightly different way from me. I am fairly sure it is this ‘club’ or culture which makes most of the deaf people I spoke to say that they wouldn’t become hearing, even given the choice. What did you learn about their families? I think there is a huge difference between being born to deaf parents or hearing parents. I was surprised to find out that 90% of deaf children are born to hearing parents. I was really impressed by how the parents of one of the boys in the film, Jake, who are hearing, had managed to learn sign language and had made such a tremendous effort to connect Jake with so many other deaf young people. It must be a minefield for hearing parents initially in how to communicate with your child but not deny them their deaf identity. You caught these young people at a certain stage in their lives – just as they’re going through big changes, moving away from home, becoming an adult and so on – how do you feel being deaf changed their experience? All the contributors had a different experience of moving into the big wide world. I think moving from a deaf school or a place where you have lots of deaf support in to a mainstream university is incredibly hard. How do you make friends when you have an interpreter and a notetaker in tow? It is incredibly hard, as Sara found out when she set off for uni. I think all my contributors in the film had real balls and were utterly inspiring, I think they will all ultimately make real successes of themselves even if it doesn’t happen straight away for all of them. How do you feel about the final film and would you like to revisit the contributors a few years down the line? I am pleased with the final film, I am very happy that the contributors and the National Deaf Children’s Society like the film and feel it represents young deaf people fairly. I felt a big responsibility in making a film about such a strong-minded culture especially as I wasn’t part of it. The five young people in the film are so engaging and I think they offer a real insight in to the experience of being deaf. If the BBC is interested in a follow-up I will be there! Deaf Teen: Hearing World will be broadcast on BBC3 at 9pm on Monday 6th February, – click here to watch the sign interpreted version of the programme on iPlayer. The program was so true, even has a hard of hearing person who grew up with quite a struggle and predjudice totally could relate. I have only just started to learn to sign so was able to pick up bits and relate to when cochlear allowed her to hear sounds for the first time. Each time I got a new hearing aid – a better model – heard new sounds, some now slightly more annoying ones. Well done on this program…. The prog highlighted a lovely mixed bunch of young Deaf people where some have a very clear direction in life re their idenity , whereas may be others are having a “wobble” or not happy or contented with what they are . Thanks Charlie for the great interview with Claire Braden. I thought it was a brilliant, honest and no-frills documentary about Deaf Teens on BBC3 last night. I believe this documentary would help lead the pathway for young deaf people to chose their paths as they progress from youthhood to adulthood. It struck the chord among many Deaf, deafened and hard of hearing people from all walks of life and it was pleasing to compare different cultural experiences and attitudes particularly from social and personal development perspective. It brought back some memories of my time with Friends for Young Deaf People (FYD) where I took part in confidence-boosting projects aimed at Deaf people and I am proud to say that many of us have progressed on to successful careers to date. On the whole It was a good programme….enjoyed it a lot. Two things that got my semantics alarm bells ringing and questioning the motives of the programme makers. 2. At end……’Meghan has a hearing boyfriend’…..what would be the point of this sentence? Do we need to know whether her boyfriend is deaf or hearing…..has anyone ever seen a programme where it says, ‘Jane Blogg (black women) has a white boyfriend’….as if that suppose to normalise black females to equal status among the whites. Can I hazard a guess….deaf – CI – hearing boyfriend = Normal……the rest abnormal….typical of hearing people to think like this or project that image. I watched this last night and found it fascinating to watch. In some areas, it really hit home. I’d love to see a show on a similar vein, perhaps with deaf people from different walks of life at different stages of life. For example, myself as a profoundly deaf working mum of two in a hearing family, compared to a profoundly deaf single bloke who has only interaction with the deaf community and perhaps also compared to an elderly retired couple both deaf, reminicising about the old days or a family who rely on their hearing children but they are leaving the nest, or a family with their deaf child about to go to boarding school. There is so much they could touch on to give a real insight into what it’s like to be deaf. As far as this film went, I wish the five well. I just wish the film hadn’t implied that a CI user would do fine at university when a non-CI user would drop out. I know it’s not the case, but it felt there was a hint of that being portrayed with Meghan being the one who succeeded because the CI meant she could and Sara who dropped out because she didn’t. I loved this programme, it was brilliant. I’m doing some more research into the deaf community and I wonder if you can put me in touch with anyone that can help me?